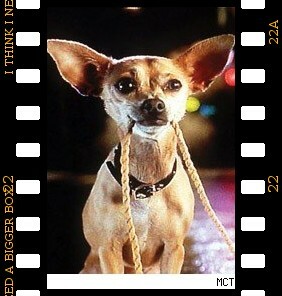 Back in the ’90s Taco Bell had an advertising campaign based around a cute chihuahua (hard to believe, I know). The ads were fresh and fun. In many ways, we who follow Christ are like the chihuahua — we have a box that we think we can fit God into. We call out to him and ask him to fill us up. Then he gives us a glimpse of his omni attributes we suddenly come to the realization that we need a bigger box. Now to him who is able to do immeasurably more than all we ask or imagine [that’s our box], according to his power that is at work within us, to him be glory in the church and in Christ Jesus throughout all generations, for ever and ever! Amen. This is something that I’ve known for a long time. However, there are times when I lose sight of this truth and I become faint of heart. It is at these times that God in his grace moves in closer to draw me out of my small box mode and back into his fullness and love that surpasses knowledge. See the whole prayer in Ephesians 3:14 -20 to see what Paul was praying for the church (and us) to receive. One area that I have been relearning in the past few months is tithing. I’ve never really been good at this act of faith but when tough times hit I justified stopping it all together. God has been gently teaching me and the rest of my family the power of stepping out in faith this way. It is difficult when trials are coming at us from all sides and work seems scarce. The economy is not being very helpful at the moment. Poor money management has put us in debt. Tithing seems to be the least reasonable thing to do in these circumstances. Yet we have recognized that God is the source of all that we receive. If he wants us to give back 10% then what right do we have to deny him? He has promised that we will be cared for. How does it hurt him when we don’t trust him? We began tithing several months ago. We did it gladly with hearts of faith, trusting that God would continue to meet our needs and bless us. My wife’s business has never been so busy. Our monthly obligations are being met. We’re learning more about trusting him and living with more peace and joy. Listen to God’s words through the prophet Malachi. God is telling us we need a bigger box! I think there’s a progression. You begin with a small box, perhaps a cereal box. Then you learn more and realize that box wasn’t big enough. You get a big box, perhaps a 100-count tomato box with the wax coating and 5 perfectly-round red tomatoes printed on the side. Then, (and this happens at different times for different people, sometimes not at all) you decide you no longer want to fit God in a box at all. When you set down that box, your hands are free to embrace a lot of wonderful things you could never touch when your hands were busy holding that big tomato box. I’m glad you are seeing the rewards of giving. I hope you continue to be blessed. Perhaps in money, definitely in spirit. Ephesians 3 is a rocking chapter. Thanks for sharing!